Lately I’ve been reading books at a fast and furious pace. Eleven in the last 6 weeks to be exact. It’s as if any day now, I expect the book police to come kick down the door and take my literary drug away, so I must read as much as I possibly can, while I can, feverishly, without stopping. I’m not reading any of these books for the first time, though. Each of the eleven I’ve recently devoured are favorites I’ve read before, some of them multiple times. These books are memoirs. Or mostly, anyway. I can’t get enough of them. My bookshelves are absolutely lousy with memoirs. I love them. And for that I am not ashamed. Though some may dismiss memoir as a lesser literary form, or perhaps not literary at at all, I think they make for the best way to spend a few quality reading hours. As I’ve been dealing with this sadness, anxiety and depression-lite, or whatever-the-heck-this-is that’s overtaken me in the last few weeks (months? ), I find that reading about other people’s struggles makes me feel better, less alone, like I might actually be fairly “normal,” in the scheme of things. Reading memoirs is the way I self-medicate. Interestingly, seven of the authors mentioned above were in the throes of alcohol and/or drug addiction at some point in their journey, which they write about eloquently in their books. Would I rather have that to deal with? But I do envy many of these authors their close family and friend connections, their community of readers, their careers, their successes. This envy is benign. It is not jealousy. I’m thrilled my favorite writers have been rewarded, that their contributions have been recognized, and that they have enjoyed financial and career success. I think this envy is instructive. Envy can point you where you want to go, it can be a light on the path telling you what it is you most want, galvanizing you to pursue that thing. The other way I self-medicate is by binge-watching and/or listening to and/or reading interviews with my favorite authors. This past Saturday, for example, I read at least a dozen interviews online with Elizabeth Gilbert, then watched 3 lengthy video interviews with her. Same with Ann Patchett. Ditto Cheryl Strayed. And David Sedaris. I guess that explains how an entire Saturday can pass into the ether with nary a “productive” thing scratched off my to-do list for the day. It occurs to me that thing I say I want to do, write and submit, write and submit, write and submit, could easily be accomplished in the time I spend consuming other people’s work, and interviews in which other people talk about their work. But it’s a balance, right? 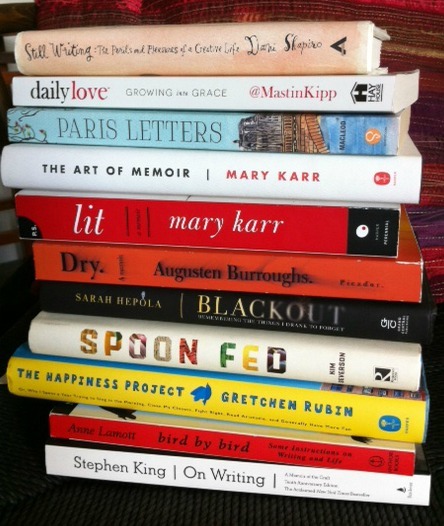 Because as a writer you must read, read, read, and read some more. And that is an assignment I eagerly embrace. And reading about creatives in your field doing work you admire can help fuel your own dreams, and motivate and inspire you to take action. That said, there’s a time to do your own work. TO DO YOUR OWN WORK. The truth is, when it comes to doing my own work, I’ve been slogging through a terrible, almost debilitating, bout of resistance the last few . . . hmm, I want to say weeks, but honestly, it’s actually been months, maybe even longer. Though Steven Pressfield’s work on resistance has saved me from labeling myself a complete loser due to this crappy state of affairs, some self-loathing remains. Just yesterday I dipped back into his book, The War of Art: Break Through the Blocks and Win Your Inner Creative Battles, to remind myself that fear and resistance can be viewed positively. Here, in a piece called “Resistance and Self-Loathing” from Pressfield’s blog, he makes the case that self-loathing is a good thing. Now to the good news about self-loathing. Self-loathing, we have said, is a form of Resistance. The apparition of Resistance is by definition a good sign, because Resistance never appears except when preceded by a Dream. By “dream” I mean a creative vision of something original and worthy that you or I might do or produce—a movie, a painting, a new business, a charitable venture, an act of personal or political integrity and generosity. The dream arises in our psyche (even if we deny it, even if we fail to or refuse to recognize it) like a tree ascending into the sunshine. Simultaneously the dream’s shadow appears—i.e., Resistance—just as a physical tree casts a physical shadow. That’s a law of nature. Thus: where we encounter Resistance, somewhere nearby is a Dream. I take comfort in that: Where there is a Dream, there is Resistance. And the way forward is to simply do the work. To behave like a professional rather than an amateur. And all those memoirs I so dearly love? They didn’t write themselves. They were the work of professionals, not amateurs. Someone pulled up to the desk everyday and did the work. They wrote. Even when the work was difficult, the going tough, the enterprise challenging. Even on days when the last thing the writer felt like doing was excavate part of their painful past to get it down on the page. This morning when I woke at 6:30 a.m., I re-read almost the entirety of The War of Art before starting my work day. It’s what got me fired up to work on this blog post today — to actually finish it and publish it to the blog. God willing, the same thing will happen tomorrow, and the next day, and the next, and the next, until the writing habit replaces the resistance habit. If you’re a creative of any kind, whether a writer, a painter, a designer, a business-builder, or anyone with any kind of project you’re struggling to work on or to complete, I cannot recommend Steven Pressfield’s The War of Art highly enough. Speed-read it some morning soon while you’re enjoying your morning beverage, and see if it doesn’t kick your buns to do the work you know you were meant to do. If you want to keep up with this series of blog posts, A Possible Theory of Happiness, feel free to sign up for “The Note,” an occasional newsletter on topics not related to copywriting and marketing. I’ll send updates related to this series there. I pick up The Wart of Art every time I’m feeling an unusually high amount of resistance. It’s like my creative bible. You have a great writing style and it’s cool to learn more about you, your thoughts, and the books you’ve read. I’m always looking for my next “fix,” via books and I think I might have to try some of the ones on your list. I checked out your website, love what you’re up to!